It's an exciting time for the Capture Wisconsin community! We have several updates to share with you, so let's jump right in. First, as many of you have seen, the Capture Wisconsin book is a huge success! We've heard from all corners of the state that the book is the best representation of the beauty of Wisconsin ever released, and we couldn't agree more. Thanks again to everyone who contributed photos and voted to help our editors find the best of the best for publication. As the book was wrapping up we asked you to stick around to continue submitting photos, entering challenges, voting and connecting with one another. You've all responded in an amazing way! Since the book phase ended, we've had more than 20,000 photos submitted, more than 1,200 new users and more than a half million votes cast. Keep submitting photos and voting for your faves to help find the best of Wisconsin. You may have noticed a few design changes on Capture Wisconsin over the last few weeks. We created a new home page, pictured above, that showcases the stunning photography of Capture Wisconsin users. Along with this change we also simplified the navigation and footer so you can easily jump in to the spot you're interested in. One of the recent changes we are most excited about is the new category page design. Capture Wisconsin is all about photos so we revamped category pages to highlight the extraordinary photography from across the state. Jump in to any category page, like landscapes, and you'll find top photos that will blow you away! The method we use to get the top photos will cycle new amazing photography into the first few pages, so be sure to check out categories time and time again. We are thrilled to present our latest showcase, The Wisconsin Sun. Over the past few weeks we've been running challenges on sunsets and sunrises. Because we had so many amazing submissions, we decided to publish a showcase that features the sun. Take a few minutes to browse The Wisconsin Sun showcase, then share it with your friends and family! Be sure to check out our latest challenges, like the Small-Town Life challenge currently running. Challenges are a great way to share your photos, win prizes and see some excellent Wisconsin photography. Finally, we are happy to announce the limited availability of Capture Wisconsin sponsorships. We've had a number of photographers and local businesses inquire about sponsorships and we've crafted a unique set of sponsorship opportunities in response. If you're interested (or know someone who would be), check out our advertise page and download the sponsorship PDF! Now you're up to date on what's new! 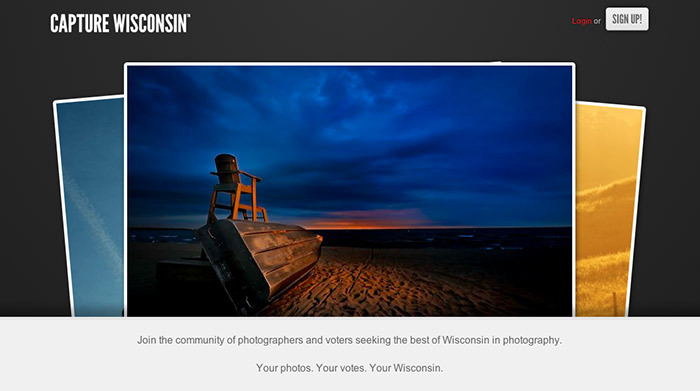 As always, keep submitting your photos and voting to shape the best of Wisconsin. Stay tuned for more features, updates and amazing Wisconsin photography!